Bronchiectasis is an abnormal and irreversible dilatation of the bronchi. A variety of causes exist. Williams-Campbell syndrome is a rare inherited disease in which the bronchial cartilage is defecient. Mounier-Kuhn syndrome is an acquired condition in which the components of the bronchial wall are defective. 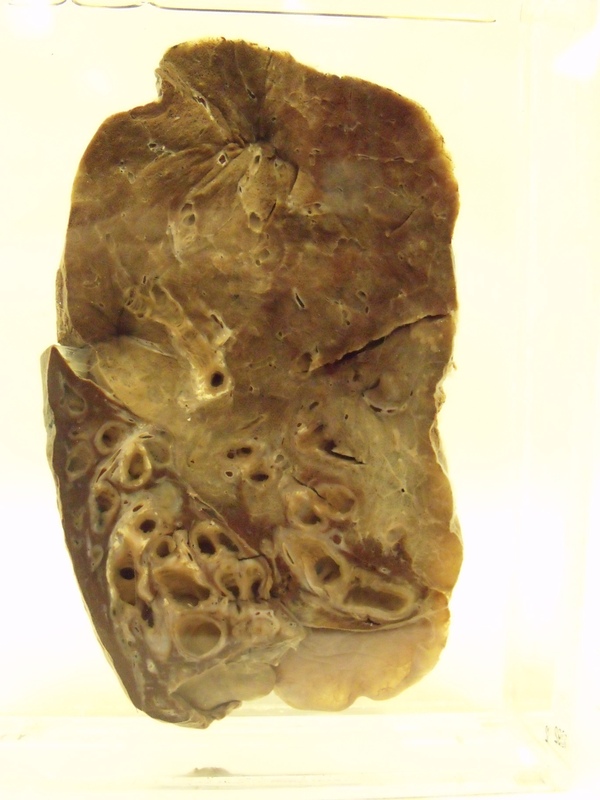 Bronchiectasis is a rare manifestation of alpha-1-antitrypsin deficiency. Bronchiectasis can be either focal or diffuse in its distribution and is usually the consequence of chronic, necrotising infection of the lungs. The airways which are most commonly affected are the segmental and subsegmental bronchi. The chronic inflammation destroys the normal components of the wall of the bronchi and these become replaced by fibrous tissue. If the process extends into the smaller airways these can become obliterated. The fibrous tissue lacks the elasticity of the normal bronchial wall and behaves in a rigid and dilated fashion. Three patterns are described for this dilatation. In the cylindrical form the affected bronchi are uniformly dilated and tubular; they end abruptly once the smaller, obliterated airways are reached. The varicose pattern has irregular, beaded dilatation. The saccular form shows ballooning of the bronchi towards the periphery of the lungs where they end in sacs that do not communicate with distal airway structures. In all three patterns there are blind-ended sacs, tubes or outpouchings which can become regions of stagnation for bronchial secretions. This stagnation facilitates bacterial infection. The inflammation induces hyperaemia and an increase in the vascularity of the walls of the bronchiectatic airways. The increase in the density of the vascularity can be sufficient to include anastomoses between the pulmonary and bronchial circulations. The affected airways are lined by ciliated or non-ciliated columnar epithelium. Squamous metaplasia can develop. The combination of increased vascularity, ongoing inflammation and infection can allow bacteria to enter the blood stream and abscesses can form at sites distant to the lung, particularly the brain. Furthermore, the same set of features can cause ulceration of the airways and an increased chance that this will extend into a large blood vessel, resulting in severe haemoptysis. Assorted bacteria can take advantage of the vulnerability of bronchiectatic lungs to infection but pseudomonas aeruginosa seems to have made a specialty of the job, especially in cystic fibrosis. Bronchiectasis is characterised by a persistent productive cough. The sputum will frequently be purulent and of large quantity. Haemoptysis is encountered in 50-70% of patients. In some cases the haemoptysis will be massive and on rare occasions fatal. If the bronchiectasis is widespread dyspnoea will result from the loss of communication between the bronchiectatic airways and the alveoli and from the destruction of lung tissue. Clubbing can develop in a variety of chronic intrathoracic conditions and bronchiectasis is no exception; clubbing is found in approximately 30% of patients. In severe, widespread disease the alterations to the pulmonary vasculature can produce pulmonary hypertension and right heart failure. Rarely, amyloidosis or brain abscesses can develop. Examination of an affected part of the lung discloses crackles and wheeze. A high resolution CT scan of the chest should permit the diagnosis to be confirmed Other investigations will concentrate on trying to determine the aetiology of the bronchiectasis. Lung function tests tend to disclose an obstructive pattern of disease. During an infective exacerbation sputum culture is important to determine the organism and its antibiotic sensitivities. The underlying cause should be treated if possible, although this will usually only stop the progression of the disease. Physiotherapy and postural drainage of the lungs can help to reduce the chances of infection. Localised disease may be amenable to surgery. Infection is treated as for pneumonia and as appropriate for the causative organism. The course of antibiotics may needed to be longer than for pneumonia in general.